Louisburg sophomore Cade Holtzen celebrates his victory in the 113-pound finals over Bonner Springs’ Cassius Vanderpool during the Frontier League Tournament on Saturday at Paola High School. 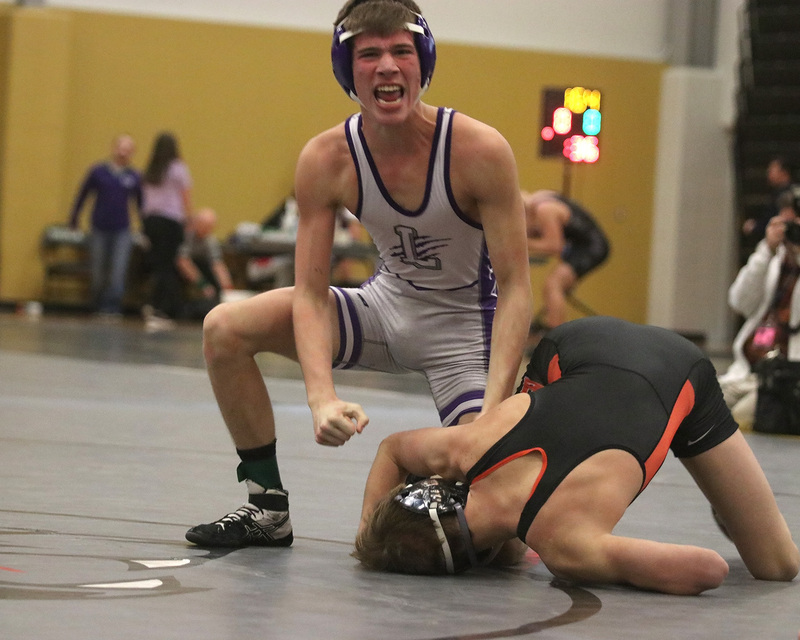 PAOLA – It may not have been as important as the regional and state tournaments, but Saturday in Paola, the Frontier League Tournament gave several Louisburg wrestlers a nice boost heading into those bigger stages. You could certainly count Cade Holtzen and Austin Moore in that group. Both wrestlers left the mats as Frontier League champions, and for Moore, it was his second league crown in as many years. 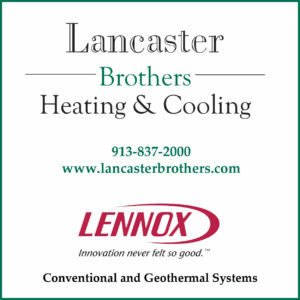 The Wildcats had six wrestlers in all finish in the top four and Louisburg took fifth in the team standings. Louisburg did all this without one their state-ranked senior captains, Blue Caplinger, who had to sit out with an injury. Bonner Springs won the league crown, Ottawa finished runner-up and Paola was third. “I’m pretty happy with where we finished up at league,” Louisburg coach Bobby Bovaird said. “The thing is, we’re not descending with our wrestling; we’re on the move up. I think the guys have pushed themselves this season and kept the right mindset so that we’re working toward peaking at the right time. Holtzen found out first-hand how competitive the league tournament was as he made his way to the finals at 113 pounds, where he squared off with Bonner Springs’ Cassius Vanderpool. Holtzen, who is ranked No. 6 in Class 4A, found himself down 4-0 early to Vanderpool, who is ranked No. 2 in Class 5A. 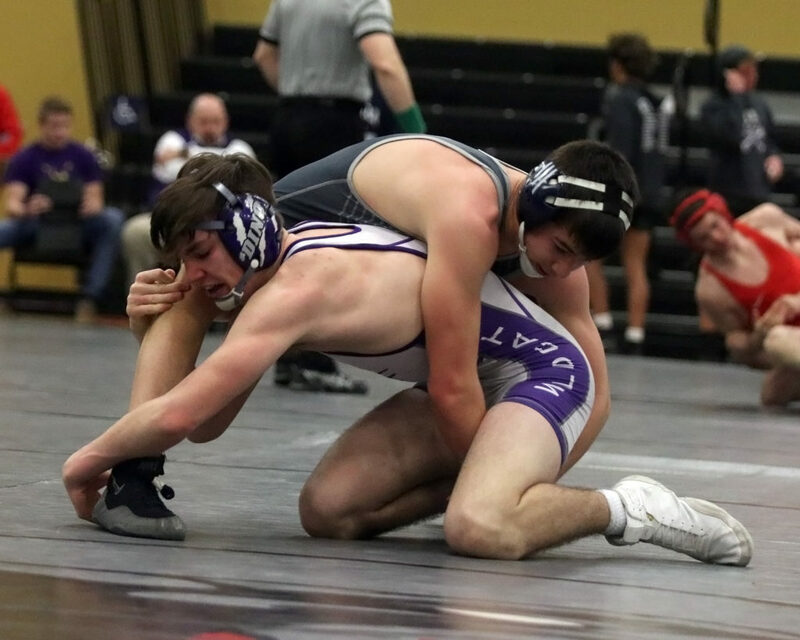 The Louisburg sophomore didn’t let the early deficit get him down as Holtzen wrestled aggressive in the third period and recorded some back points before pinning Vanderpool with 21 seconds left in the match to earn his first league title and improve his record to 28-3 on the season. Louisburg senior Austin Moore works for a pin Saturday during the Frontier League Tournament. Moore won the league crown at 220 pounds. Moore, who is in just his second tournament back from injury, made his presence known. 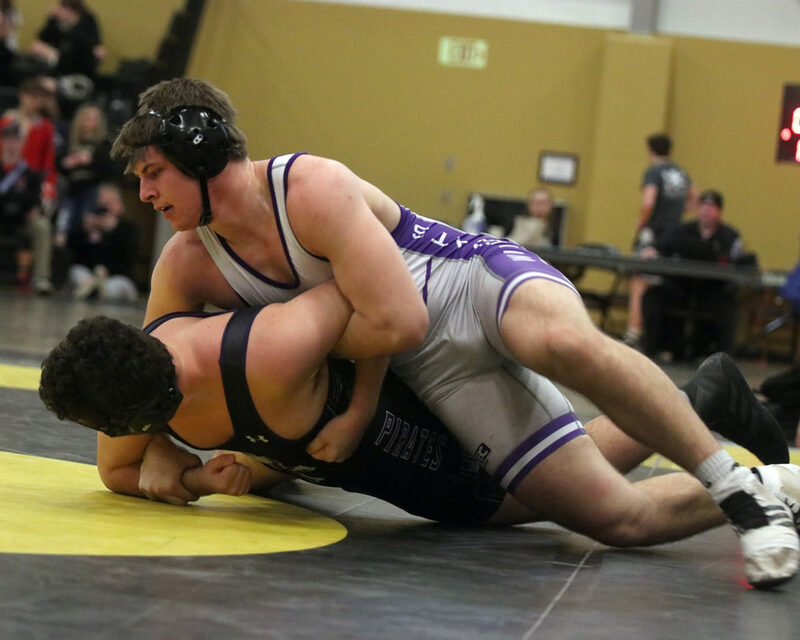 The Louisburg senior rolled through the 220-pound bracket and pinned his way to a league title, including a pin of Ottawa’s Jared Ferguson in the second period. Moore improved his record to 8-0 on the season and is currently No. 2 in the state in Class 4A. Freshman Brandon Doles made his first league tournament a memorable one as he reached the league finals at 145 pounds. He defeated Paola’s Corey Holub by a 4-1 decision and Eudora’s Holden Andrews by a 6-3 decision earns a spot in the finals. Doles met Bonner Springs’ Holden Lentz, and despite getting pinned, earned a second-place league finish and improved his record to 25-9 on the season. Louisburg freshman Brandon Doles finished second in the Frontier League at 145 pounds. Senior Gabe Bonham (138 pounds) and sophomore Ben Wiedenmann (182) each had big days as they finished with just one loss and both medaled third. Bonham (14-8) pinned Bonner Springs’ Shane Daniels in the third place match, while Wiedenmann (21-9) navigated a tough 182-pound bracket and won a close 5-4 decision over Baldwin’s Cy Hockey in his third-place match. Sophomore Ryan Owens also found his way to the podium at 120 pounds as he finished fourth. Owens was 2-1 heading into this third-place match with Baldwin’s Lucas Hopper, but could lost a close 1-0 decision to run his record to 26-10 on the season. “Brandon stepped up and won a couple tough matches to make the finals, and I love how coachable he is,” Bovaird said. “He’s made the transition into the high school level of wrestling very well. Gabe and Ben are seeing the benefits of their hard work now paying off on the mat. Gabe is probably one of the hardest workers in the practice room, and it’s helping him and his practice partners. Ben is such a smart athlete, and now that he’s seeing more success, he’s gaining a huge boost in confidence. Senior Brian Houck ended his tournament on a strong note at 195 pounds as he pinned Bonner Springs’ Ismael Hernandez in the second period to finish in fifth overall. Freshman A.J. Reed filled in for Caplinger at 170 pounds to take seventh and sophomore Jacob Briley was eighth at 160. The season will end for some of the Wildcats this weekend as they return to Paola. Louisburg will take part in the Class 4A regional tournament beginning Friday and wrapping up Saturday at Paola High School. The top four in each weight class will earn a berth in the state tournament in Salina and the Wildcats are excited to see what their future holds. “Sunday, I had a pretty good sized group come in for an optional practice, and the thing we ended with was a little talk about the mindset we need to have,” Bovaird said. “No one needs to worry about their records, their seeds, having to beat so-and-so, or anything like that, which is beyond their control. We need to focus on one thing: wrestling our best. That’s the only pressure they should have, and that’s one of the few things within their control.